Proverbs Chapters 1-10 Star Chart: Clockwise from when (Cepheus) Christ "stretched out" his hand, and no man regarded" (1:24) in crucifixion in April 31 AD and "I will (Aquarius) pour my (Milky Way) spirit upon you" (1:23) in June 31 AD till "They shall eat the (solar fiery or lunar) fruit of their own way, and be filled with their own (Andromeda-shackle and Pisces-rope captivity) devices" (1:31) in Sept. 70 AD when the Temple was burned and Jews were taken into captivity which will "swallow them as (lunar open mouth) sheol" (1:12) is 473° months or one complete lap of 360° + 113°. This is the "dark saying" (1:6) in chapter one. Then, clockwise from "in the beginning of his way, before his works of old.... from the beginning ... When there were no depths, I (wisdom) was brought forth; when there were no fountains abounding with water. Before the mountains were settled, before the hills was I brought forth: While as yet he had not made the earth, nor the fields, nor the highest part of the dust of the world. When he prepared the heavens, I (wisdom) was there: when he set a (red radius) compass upon the face of the depth: When he established the clouds above: when he strengthened the fountains of the deep: When he gave to the (Aquarius) sea his decree, that the waters should not pass his commandment: when he appointed the foundations of the earth" (Pr. 8:22-29) in 3960 BC till "Wisdom hath builded her (red radius) house, she hath (lunar axe; Bootes, Hercules, Perseus & Orion) hewn out her seven pillars" (Pr. 9:1) in 967 BC when Solomon "began to build the house of the Lord" (1 Ki. 6:1) is eight laps of 360° (or 2880° years) + 113° years. The seven "pillars" of wisdom are men (Gal. 2:9) from Creation in 3960 BC till 967 BC. "Seven men who can render a reason" (Pr. 26:16). They are Noah, Abraham, Isaac, Jacob, Joseph, Moses and David. The birth date of each is given (except Noah). 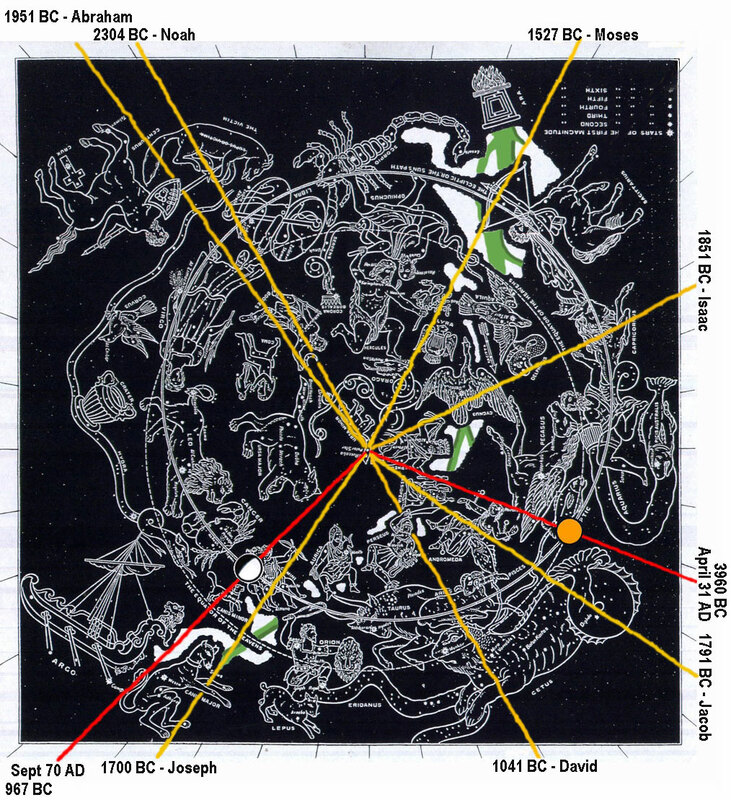 6 To understand a proverb, and the interpretation; the words of the wise, and their dark sayings (star chart messages). 9 For they shall be an ornament of (solar or lunar) grace unto thy (Pollux) head, and (red radius) chains about thy (Castor) neck. 10 My son, if (Gemini) sinners entice thee, consent thou not. 16 For their feet run to evil, and make haste to shed (red radius) blood. 17 Surely in vain the (red radius) net is spread in the (lunar eyeball) sight of any (Corvus, Aquila, Cygnus, and Lyra) bird. 18 And they lay wait for their own (red radius) blood; they lurk privily for their own (Gemini) lives. 19 So are the ways of every one that is greedy of (solar golden) gain; which taketh away the life of the (Gemini) owners thereof. 22 How long, ye simple (Gemini) ones, will ye love simplicity? and the (Gemini) scorners delight in their (red radius) scorning, and (Gemini) fools hate knowledge? 23 Turn you at my (red radius) reproof: behold, I (Aquarius) will pour out my (Milky Way) spirit unto you (June 31 AD), I will make known my (red radius) words unto you. 27 When your fear cometh as (Gemini) desolation, and your (solar fiery) destruction cometh as a (Milky Way) whirlwind (Sep 70 AD); when distress and anguish cometh upon you. 30 They would none of my (red radius) counsel: they despised all my (red radius) reproof. 31 Therefore shall they (lunar open mouth) eat of the (solar fiery) fruit of their own way, and be filled with their own (Andromeda shackles and Pisces leash) devices. 32 For the turning away of the (Gemini) simple shall (red radius) slay them, and the (solar golden) prosperity of (Gemini) fools shall (red radius) destroy them. 33 But whoso (lunar ear) hearkeneth unto me shall dwell safely, and shall be quiet from fear of evil. 5 Then shalt thou understand the fear of the (Shekinah) Lord, and find the knowledge of (Shekinah) God. 6 For the Lord giveth wisdom: out of his (lunar) mouth cometh (red radius) knowledge and understanding. 7 He layeth up sound wisdom for the righteous: he is a (solar golden) buckler to them (Gemini) that walk uprightly. 8 He keepeth the paths of judgment, and preserveth the (Milky) way of his (Gemini) saints. 17 Which forsaketh the guide of her youth, and forgetteth the covenant of her (Shekinah) God. 18 For her (red radius) house inclineth unto (Cetus) death, and her paths unto the (Cetus) dead. 19 None that go unto her (Andromeda) return again, neither take they hold of the paths of life. 20 That thou mayest walk in the way of good (Gemini) men, and keep the paths of the righteous. 4 So shalt thou find favour and good understanding in the (lunar eyeball) sight of God and man. 6 In all thy ways acknowledge him, and he (Shekinah Glory) shall direct thy paths. 7 Be not wise in thine own (lunar or solar) eyes: fear the Lord, and depart from evil. 8 It shall be health to thy (solar) navel, and (lunar) marrow to thy bones. 10 So shall thy (red radius) barns be filled with plenty, and thy presses shall burst out with (red radius) new (lunar or solar) wine. 12 For whom the Lord loveth he correcteth; even as a (Pollux) father the (Castor) son in whom he delighteth. 14 For the merchandise of it is better than the merchandise of (lunar) silver, and the gain thereof than fine (solar) gold. 16 Length of days is in her right hand; and in her left hand (solar golden) riches and honour. 18 She is a (zodiac) tree of life to them that lay hold upon her: and happy is every one that retaineth her. 20 By his knowledge the depths are broken up, and the (Milky Way) clouds drop down the (rotating stars) dew. 22 So shall they be life unto thy soul, and grace to thy (Pollux) neck. 23 Then shalt thou walk in thy way safely, and thy (Cepheus; Canis Minor) foot shall not stumble. 26 For the Lord shall be thy confidence, and shall keep thy (Cepheus; Canis Minor) foot from being taken. 28 Say not unto thy neighbour, Go, and come again, and to morrow I will give; when thou hast it (solar gold) by thee. 33 The (lunar black) curse of the Lord is in the (red radius) house of the wicked: but he (solar golden) blesseth the habitation of the just. 35 The wise shall inherit (solar) glory: but (red radius) shame shall be the promotion of (Gemini) fools. 4:1 Hear, ye (Gemini) children, the instruction of a father, and attend to know understanding. 3 For I was my (Pollux) father's son, tender and only beloved in the (lunar) sight of my (Castor) mother. 9 She shall give to thine (Pollux; Andromeda) head an ornament of (lunar) grace: a (solar) crown of glory shall she deliver to thee. 10 Hear, O my son, and (lunar ear) receive my sayings; and the years of thy life shall be many. 14 Enter not into the path of the wicked, and go not in the way of (Gemini) evil men. 17 For they eat the (lunar) bread of wickedness, and drink the (lunar wine skin and red radius) wine of violence. 18 But the path of the just is as the (solar) shining light, that shineth more and more unto the perfect day. 19 The way of the wicked is as (zodiac) darkness: they know not at what they stumble. 20 My son, attend to my words; incline thine (lunar) ear unto my (red radius) sayings. 21 Let them not depart from thine (lunar and solar) eyes; keep them in the midst of thine (lunar) heart. 24 Put away from thee a froward (lunar) mouth, and perverse (lunar) lips put far from thee. 25 Let thine (lunar and solar) eyes look right on, and let thine eyelids look (red radius) straight before thee. 27 Turn not to the right hand nor to the left: remove thy (Cepheus; Canis Minor) foot from evil. 4 But her end is bitter as (lunar) wormwood, sharp as a (red radius) two-edged sword. 5 Her (Cepheus; Canis Minor) feet go down to (lunar) death; her steps take hold on (solar) hell. 7 Hear me now therefore, O ye (Gemini) children, and depart not from the words of my (lunar) mouth. 13 And have not obeyed the voice of my (Gemini) teachers, nor inclined mine (lunar) ear to them that instructed me! 15 Drink waters out of thine own (lunar) cistern, and running waters out of thine own (solar) well. 18 Let thy fountain be blessed: and rejoice with the (Castor) wife of thy youth. 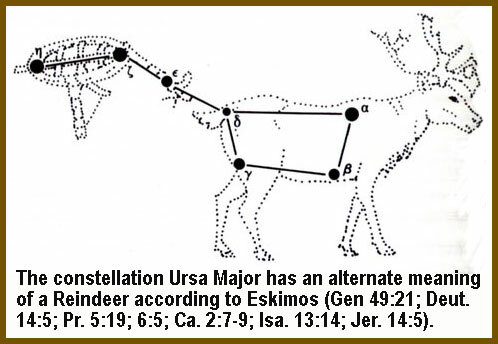 19 Let her be as the loving hind and pleasant roe (Cassiopeia is five reindeer stags; Ursa Major is a Reindeer according to Eskimos); let her (lunar and solar) breasts satisfy thee at all times; and be thou ravished always with her love. 20 And why wilt thou, my son, be ravished with a strange (Andromeda) woman, and embrace the bosom of a stranger? 21 For the ways of man are before the (lunar and solar) eyes of the Lord, and he pondereth all his goings. 22 His own iniquities shall take the wicked himself, and he shall be holden with the (red radius) cords of his sins. 2 Thou art snared with the words of thy (lunar) mouth, thou art taken with the words of thy (lunar) mouth. 4 Give not sleep to thine (lunar or solar) eyes, nor slumber to thine eyelids. 5 Deliver thyself as a roe from the hand of the hunter, and as a (Cygnus) bird from the hand of the fowler. 12 A naughty person, a wicked man, walketh with a froward (lunar) mouth. 21 Bind them continually upon thine (lunar) heart, and tie them about thy (Pollux) neck. 24 To keep thee from the evil (Andromeda) woman, from the flattery of the (lunar) tongue of a strange woman. 25 Lust not after her beauty in thine (lunar) heart; neither let her take thee with her (lunar) eyelids. 26 For by means of a (Andromeda) whorish woman a man is brought to a piece of (lunar) bread: and the (Andromeda) adultress will hunt for the precious life. 27 Can a man take (solar) fire in his bosom, and his clothes not be burned? 28 Can one go upon hot (solar) coals, and his feet not be (black zodiac) burned? 29 So he (Pollux) that goeth in to his neighbour's wife; whosoever toucheth her (Castor) shall not be innocent. 31 But if he be found, he shall restore sevenfold; he shall give all the substance of his (red radius) house. 2 Keep my commandments, and live; and my law as the (solar) apple of thine (lunar) eye. 3 Bind them upon thy fingers, (red radius pen) write them upon the (lunar white) table of thine heart. 10 And, behold, there met him a woman with the attire of an harlot, and subtil of (lunar) heart. 16 I have decked my bed with coverings of tapestry, with carved works, with fine (Milky Way) linen of Egypt. 17 I have perfumed my bed with myrrh, aloes, and (red radius) cinnamon. 18 Come, let us take our fill of love until the (sun on red radius horizon) morning: let us solace ourselves with loves. 20 He hath taken a (lunar) bag of money with him, and will come home at the day appointed. 21 With her much fair speech she caused him to yield, with the flattering of her (lunar) lips she forced him. 23 Till a (red radius) dart strike through his (lunar) liver; as a bird hasteth to the (red radius) snare, and knoweth not that it is for his life. 24 Hearken (with lunar ear) unto me now therefore, O ye (Gemini) children, and attend to the words of my (lunar) mouth. 26 For she hath cast down many wounded: yea, many strong (Gemini) men have been slain by her. 27 Her (red radius) house is the way to (solar) hell, going down to the chambers of death. 8:1 Doth not wisdom cry? and understanding put forth her (red radius) voice? 3 She crieth at the (solar golden) gates, at the entry of the city, at the coming in at the (lunar) doors. 4 Unto you, O (Gemini) men, I call; and my voice is to the (Gemini) sons of man. 5 O ye simple, understand wisdom: and, ye fools, be ye of an understanding (lunar) heart. 6 Hear (with lunar ear); for I will speak of excellent things; and the opening of my (lunar) lips shall be right things. 7 For my (lunar) mouth shall speak truth; and wickedness is an abomination to my lips. 10 Receive my instruction, and not (lunar) silver; and knowledge rather than choice (solar) gold. 11 For wisdom is better than (red radius) rubies; and all the things that may be desired are not to be compared to it. 13 The fear of the Lord is to hate evil: pride, and arrogancy, and the evil way, and the froward (lunar) mouth, do I hate. 15 By me (Cepheus) kings reign, and princes decree justice. 16 By me (Cepheus) princes rule, and nobles, even all the judges of the earth. 17 I love them that love me; and those that seek me early (sun on red radius horizon) shall find me. 18 Riches (solar gold) and honour are with me; yea, durable riches and righteousness. 19 My fruit is better than (solar) gold, yea, than fine gold; and my revenue than choice (lunar) silver. 21 That I may cause those that love me to inherit substance; and I will fill their (solar golden) treasures. 22 The Lord possessed me in the beginning of his way (3960 BC), before his works of old. 23 I was set up from everlasting, from the beginning (3960 BC), or ever the earth was. 31 Rejoicing in the habitable part of his earth; and my delights were with the (Gemini) sons of men. 32 Now therefore (lunar ear) hearken unto me, O ye (Gemini) children: for blessed are they that keep my ways. 34 Blessed is the man that (lunar ear) heareth me, (lunar eye) watching daily at my (solar) gates, waiting at the (red radius) posts of my doors (967 BC). 5 Come, eat of my (lunar) bread, and drink of the (solar) wine which I have mingled. 7 He that reproveth a scorner getteth to himself (red radius) shame: and he that rebuketh a wicked man getteth himself a (lunar) blot. 10 The fear of the Lord is the beginning of wisdom: and the knowledge of the holy (Shekinah) is understanding. 17 Stolen waters are sweet, and (lunar) bread eaten in secret is pleasant. 18 But he knoweth not that the (zodiac constellations) dead are there; and that her guests are in the depths of (lunar or solar) hell. 10:1 The proverbs of Solomon. A wise (Castor) son maketh a glad (Pollux) father: but a foolish (Castor) son is the heaviness of his (Pollux) mother. 2 Treasures of wickedness (solar gold) profit nothing: but righteousness delivereth from (lunar grave) death. 3 The Lord will not suffer the soul of the righteous to famish: but he casteth away the (solar golden) substance of the wicked. 4 He becometh poor that dealeth with a slack hand: but the hand of the diligent maketh (solar golden) rich. 5 He that gathereth in summer is a wise son: but he that sleepeth in harvest is a son that causeth (red radius) shame. 6 Blessings are upon the (Castor; Andromeda) head of the just: but violence covereth the (Pollux) mouth of the wicked. 7 The memory of the just is (solar golden) blessed: but the name of the wicked shall (lunar grave) rot. 8 The wise in heart will receive (solar golden) commandments: but a prating fool shall fall. 10 He that winketh with the (lunar) eye causeth sorrow: but a prating fool shall fall. 11 The mouth of a righteous man is a (solar golden) well of life: but (red radius) violence covereth the (Pollux) mouth of the wicked. 13 In the (lunar) lips of him that hath understanding wisdom is found: but a (red radius) rod is for the back of him that is void of understanding. 14 Wise men lay up (solar golden) knowledge: but the (lunar) mouth of the foolish is near (lunar grave) destruction. 15 The rich man's (solar golden) wealth is his strong city: the destruction of the poor is their (lunar empty pocket) poverty. 18 He that hideth hatred with lying (lunar) lips, and he that uttereth a slander, is a fool. 19 In the multitude of words there wanteth not sin: but he that refraineth his (lunar) lips is wise. 20 The tongue of the just is as choice (lunar) silver: the (lunar) heart of the wicked is little worth. 21 The (lunar) lips of the righteous feed (Gemini & Milky Way) many: but (Gemini) fools die for want of wisdom. 22 The blessing of the Lord, it maketh (solar golden) rich, and he addeth no sorrow with it. 23 It is as sport to a fool to do mischief: but a man of understanding hath (solar golden) wisdom. 24 The (lunar dark) fear of the wicked, it shall come upon him: but the (solar golden) desire of the righteous shall be granted. 25 As the (Milky Way) whirlwind passeth, so is the wicked no more: but the (Gemini) righteous is an everlasting foundation. 26 As vinegar to the (lunar white) teeth, and as smoke to the (lunar) eyes, so is the (Castor) sluggard to (Pollux, etc.) them that send him. 28 The hope of the righteous shall be (lunar crescent smiling) gladness: but the expectation of the wicked shall (lunar grave) perish. 31 The mouth of the just bringeth forth (solar golden) wisdom: but the froward tongue shall be (red radius) cut out. 32 The (lunar) lips of the righteous know what is (solar golden) acceptable: but the (lunar) mouth of the wicked speaketh (red radius) frowardness.